Ambleside Oral History Group commenced recording in 1976 and has created an archive of over 300 interviews, on almost every subject related to life in Ambleside, Cumbria, and its surrounding area, in the Lake District of England, beginning with memories from the 1880’s. The archive exists in both printed transcript and electronic document form, as well as sound on CD. The transcripts are searchable by topic or keyword from the group’s website. 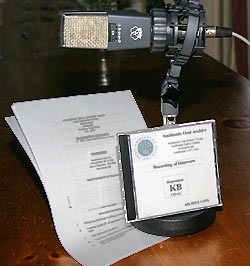 Recordings of interviews can be heard by prior arrangement. The archive is open to all, and can also be accessed in person at the libraries listed on the group’s website. It is wise to contact the libraries in advance to arrange help and guidance into the material. Members of the group will also give talks locally accompanied by extracts of recordings on a variety of topics, by prior arrangement. This archive entry was last updated on 3 June 2014. Information incorrect or out-of-date?